The trend for small, low-powered valve combos that allow tube-driven, harmonically-rich overdrive sounds to be captured without reaching eardrum-perforating decibel levels continues apace. 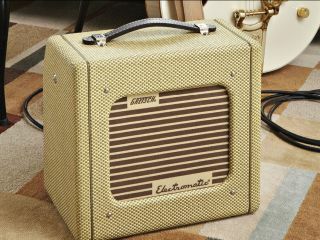 One of the sexiest small amplifiers at the NAMM show was undoubtedly the Gretsch G5222 Electromatic Amp. Rather like Fender's recent Champion 600 reissue, the Gretsch is a simple circuit, kicking out just five watts courtesy of two valves and a single six-inch driver. Stock should be winging its way to UK retailers as we write this, with an RRP of £159.99. For more, visit the official Gretsch website.